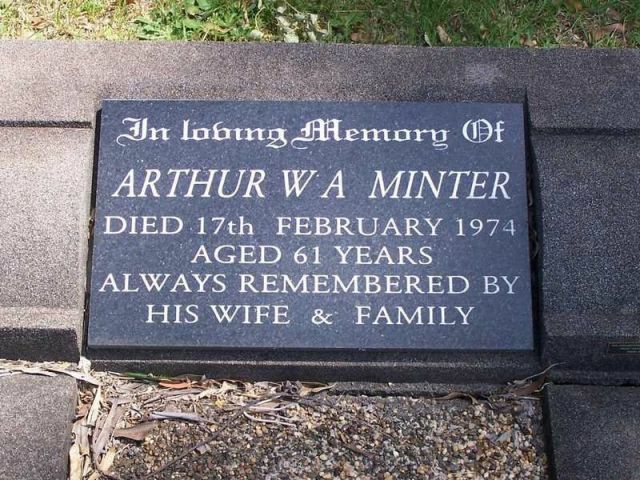 Gail Gniewosz has found Arthur, his wife and mother in a number of Electoral Rolls in the Cowper area, NSW. He was evidently a farmer of 2660 acres with 43 horses, 37 cows and 1794 sheep at one point. [mother] Mary Elizabeth Minter, home duties. Nina Winfred Minter, home duties. Death notice in the Sydney Morning Herald on 20 February 1974 gave age as 61, 'late of Bonny Hills'. NSW reg no. 11475/1913 per John Spencer, from NSW BMD index, July 2008. NSW BMD reg no. 12227/1909. Date from Debbie Noakes, July 2009. NSW BMD reg no. 18397/1933.